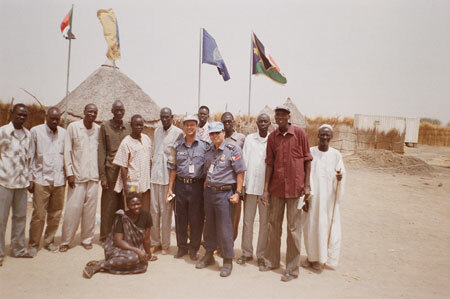 Local workers and the two U.N. guards that accompanied Moro during fieldwork, at the administrative compound in Paloich town. Morton, Chris. "Paloich administrative compund" Southern Sudan Project (in development). 03 Jan. 2006. Pitt Rivers Museum. <http://southernsudan.prm.ox.ac.uk/details/2007.137.15/>.